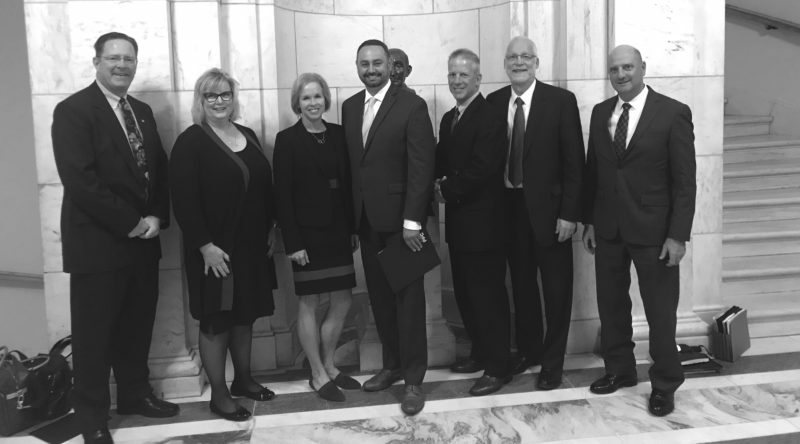 Representatives of the Public Power Council and consumer-owned utilities from around the Pacific Northwest traveled to Washington, D.C. in October to share their concerns about the industry with members of Congress. Roger Kline, General Manager of Northern Wasco County PUD, was part of the delegation. The affordable power available through Bonneville has been the largest economic driver in the region, he says. Those low rates are why industries needing large amounts of electricity locate in the Northwest. “Whether they are the aluminum smelters of old, or now the data centers, cryptocurrency miners or other large power users that have found their way here because it is the lowest cost region to do that,” Roger says. Most of the Northwest’s power infrastructure—dams, transmission lines, etc.—was built in the 1930s, 1940s and 1950s, and its use has extended past its anticipated life span. Reinvesting in that physical resource, as well as addressing the “silver tsunami” of looming industry retirements, places an increasing demand on industry resources. And that’s not all. Multiple special interest groups continue to seek financial support from Bonneville. “These are all necessary things, things we value locally like the fish and wildlife program, the environment, keeping the resource running and reinvesting in the transmission system, and working with the U.S. Army Corps of Engineers and the Bureau of Reclamation to keep the dams themselves operating efficiently,” Roger says. At the same time, the demand on the hydropower market has decreased with the influx of intermittent renewable resources like wind and solar power. Natural gas prices have also dropped with the advent of fracking. In this changing environment, the Public Power Council serves as a forum where consumer-owned electrical utilities come together to create consensus on issues impacting the operations and the cost of the Federal Columbia River Power System and the Bonneville Power Administration. Roger and the group were sharing that perspective on their trip to Washington. That could change if costs continue to rise, he says. Northern Wasco’s 2019 budget is about $53 million and over $30 million of that figure is energy. The visiting delegation also took the trip as an opportunity to thank legislators, including U.S. Rep. Greg Walden and Sen. Ron Wyden, for their support of the industry. In particular, these legislators have worked to assure that plans to privatize Bonneville have not moved forward. The federal system is important to Northern Wasco for reasons beyond supply affordability, Roger says. The Dalles is a central location to the power delivery system. Many of the employees who work at the Celilo Converter Station, Big Eddy Substation, and the big hydropower dams at Bonneville, The Dalles, John Day and McNary live in Northern Wasco’s service area. Power is also driving a significant amount of industrial growth in Northern Wasco’s service area. The utility is poised to become the second-largest consumer-owned utility in Oregon based on power load. That growth benefits the community through jobs, through revenues that help keep utility rates low, and in other ways, too. “Through franchise fees, the bigger we are, the more we transfer to the city for its uses,” Roger says. Franchise fees have climbed to over $1 million in the past few years. In 2018, they will be over $1.2 million and predictions are that the 2019 fees will climb to more than $1.5 million. “Those are very conservative estimates,” Roger says. The utility is also investing in infrastructure. New substations are planned for east The Dalles and Tygh Valley, which will have a positive effect on reliability. They are also addressing community and utility growth through technical and staffing solutions. Staff has increased slightly over the past three years, but as some employees have retired or left, PUD leaders have also examined the anticipated future needs of the utility and brought in employees with different styles and skill sets. One of the changes in Washington D.C. called to Roger’s attention by other utility delegation members is a greater alignment toward party over region. In the past, legislators have met as a Northwest delegation to address regional priorities. That appears to no longer be the case. There is a resulting stigma that he says is undeserved. “We are pro-environment, aquatic species and terrestrial species, because we are from the Pacific Northwest. It doesn’t matter what side of the aisle you are from, we all have regional needs and regional things we all care for. Our hope is that we use science and economics and understanding and common sense when we make these decision, rather than extreme belief and sensationalized policy actions.” He points to the extreme spill through the Columbia River system this spring and summer, when water levels got so high they carried a houseboat into the power lines at The Dalles Marina. The other risk from extreme spill is the effect of dissolved gasses, which can cause the bends in juvenile fish migrating downstream, resulting in adverse impacts on returning adult salmon.